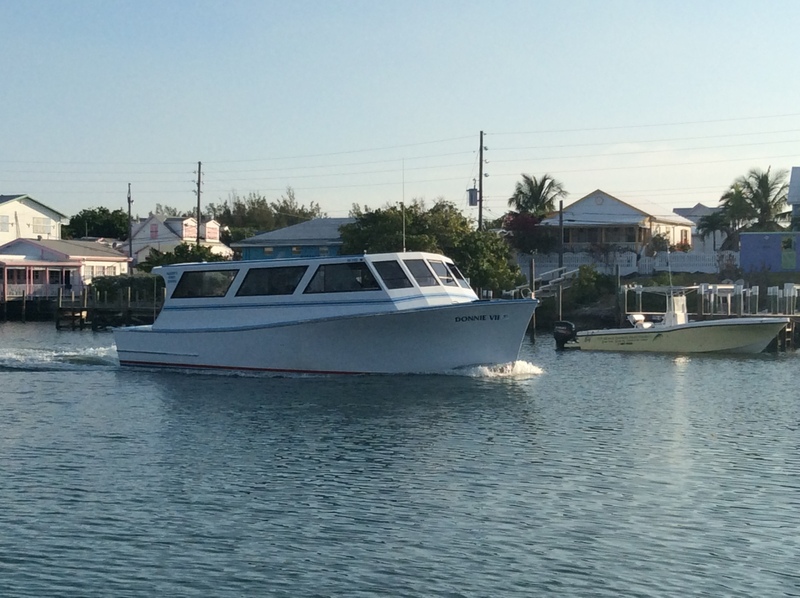 It was an interesting day as we traveled the NW Providence Channel from Spanish Wells to the Abacos. The fishing rods were deployed early for the all day trip as these Atlantic waters are renowned for their fishing. Soon thereafter, things started to get active. We had multiple strikes and the loss of two cedar plugs. Reaching the deep 12,000 foot waters, we have our first fish in the boat. Surprisingly, it is a Triple Tail. We had to look this one up in the fishing guide as we have never seen or caught one before. It is puzzling why this species was in such deep water as it is mostly known to inhabit shallower realms. A few hours later, we notice something big playing with our large artificial lure tossing it out of the water several times. He next moves over to the rigged ballyhoo line playing with it also. This fish never strikes either rig and soon wanders off. 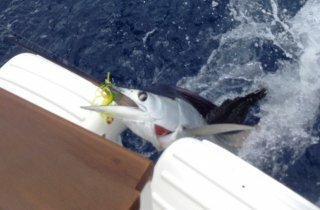 We think it was either a Sailfish or Marlin. It’s probably good we didn’t hook up with him. The reels continue to get a workout with several more strikes before we have our first Mahi hookup. After a 30 minute battle, Jeff has him in the cooler. I hope there is room in the freezer for this 30 pounder. Just before entering the Little Harbour Inlet, we see our first whale of the season lazily sunning himself on the surface. We think he is a 30 foot long Pilot Whale. 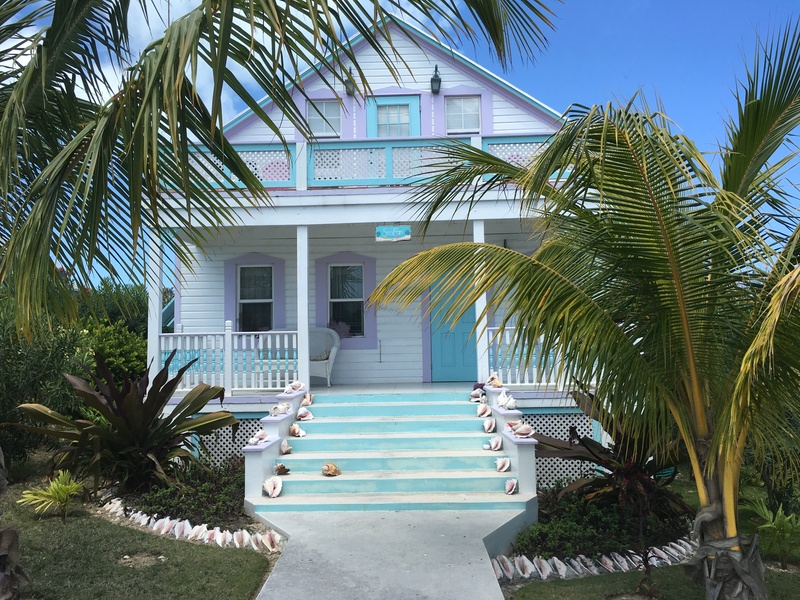 The Sea of Abaco is our cruising grounds for the next three weeks. These sheltered waters, with Great Abaco Island to the West and the smaller Cays to the East bordering the Atlantic reefs, offer many cruising opportunities. 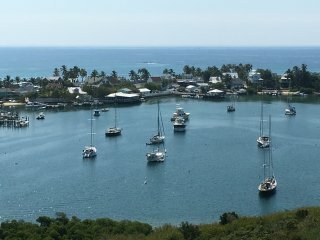 Our first week is spent in the picturesque Hope Town harbor swinging on one of Captain Jack’s mooring balls. The tiny circular harbor is filled with mooring balls as anchoring is not allowed. Watching the daily coming and going of boats, many chartered, is a popular pastime. There are several tense moments as these rental captains, many inexperienced, struggle to attach the mooring pendant to their boat without coming into contact with nearby neighbors. In addition to the charters, Albury’s Ferry Service runs hourly from Marsh Harbor. The local water taxi for the Abaco Inn adds to the fabric of the harbor activities. Our days stay busy as we settle into the island routine. The first stop each morning is Vernon’s Grocery to check the assortment of fresh bread and pies that Vernon personally bakes each day. Walking the small concrete paths between the brightly colored homes leads us to the beautiful wide sandy beaches for shelling and collecting beach glass. One stop is the candy strip lighthouse that stands guard over the harbor. It is a national landmark and is featured in many photos of the Bahamas. The original lens and turning equipment made in the early 1900’s by an English company is still working today. Thanks to dedicated volunteers, the light continues to shine as it has for the past 80 years. 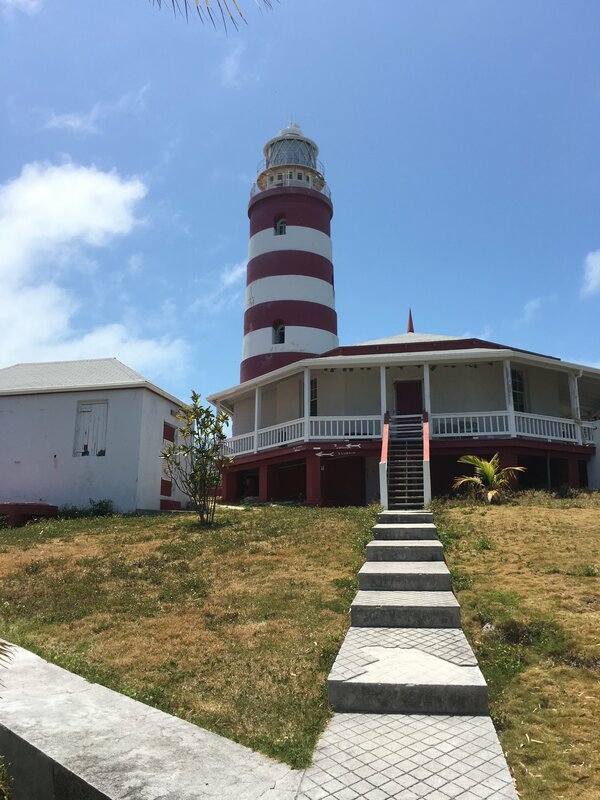 Climbing the 101 steps leading to the top, we are rewarded with magnificent views of the harbor and surrounding islands. Other days finds us on the bikes riding from one end of Elbow Cay to the other on the one main road, The Queens Highway. With friends visiting in a few days, we move over to Marsh Harbor and take a slip at Harbor View Marina. Our three days there are filled with a much needed boat cleaning, laundry, and grocery shopping while waiting on Dennis and Mary to arrive. 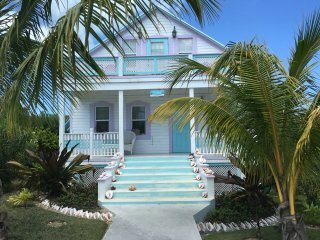 The weather forecast couldn’t be better for the next week while we tour the Abacos with our friends. 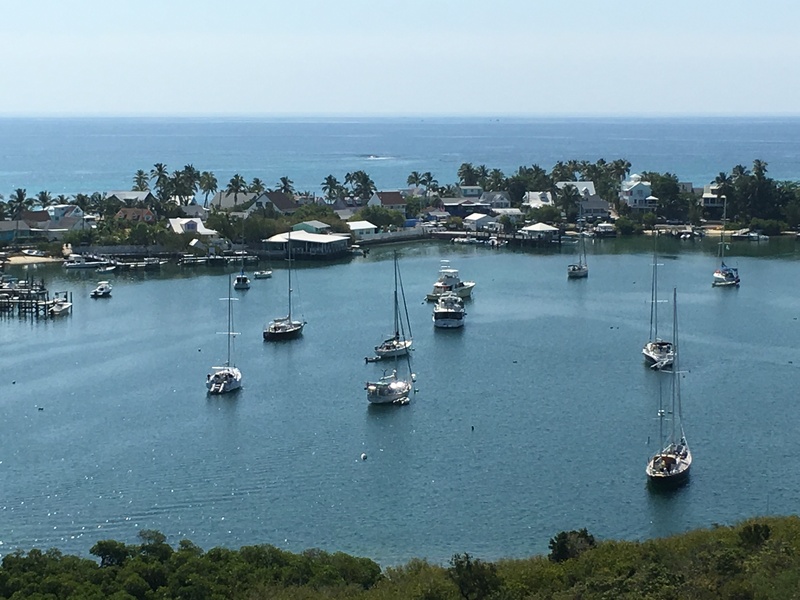 Our first stop is Man-O-War Cay where we anchor just outside the inner harbor. 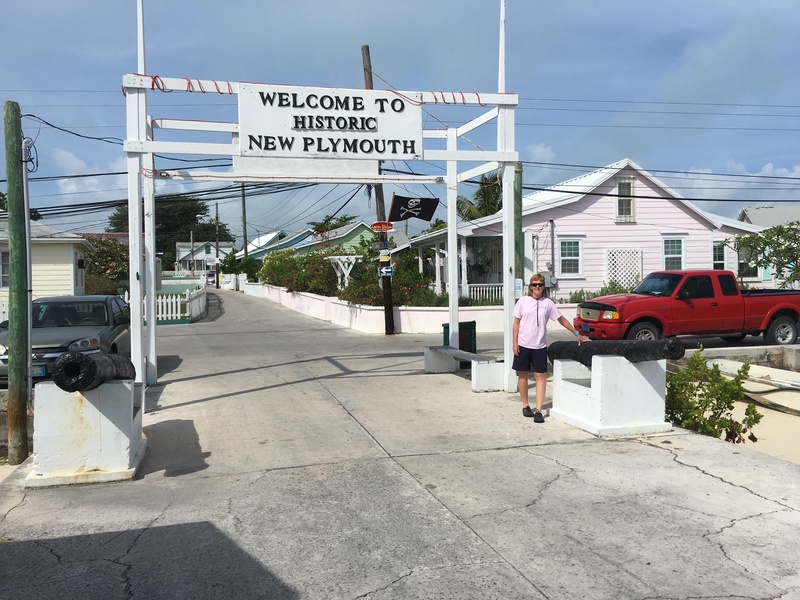 Like Hope Town and Spanish Wells, this tiny village was settled by English Loyalists in the 1600’s. Boat building and sail making continue to keep this settlement vibrant as it has for the past 200 years. 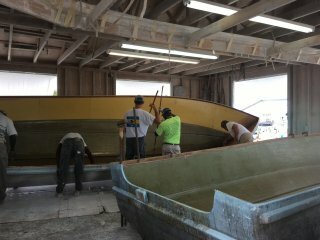 Most of the boat building shops are open for public viewing. It is interesting to see how current fiberglass boats are built by the Albury family. 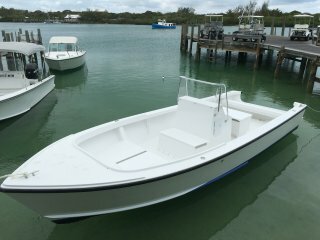 These beautiful handmade watercraft are seen throughout the islands both as work boats and pleasure craft. A great dinner is had at the Dock and Dine Restaurant followed by ice cream at the local ice cream booth. 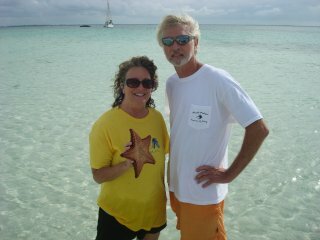 With continued good weather we explore Great Guana Cay and also Leonard Cay anchorage. The highlight for Dennis was our offshore fishing. 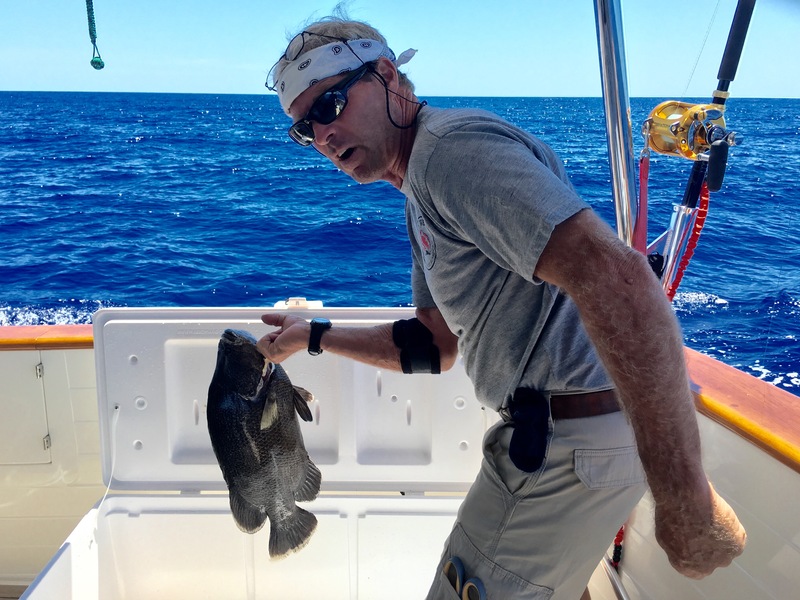 Within 15 minutes of setting the lines, Dennis was fighting his first fish. An 80 lb. 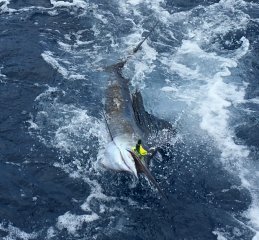 Sailfish took the bait and gives a good 30 minute fight before Dennis lands him on the dive platform. He is quickly released unharmed. This was a first for both Dennis and Idyll Time as we have never caught a sailfish aboard IT. Way to go Dennis! Our fishing luck continued the next day as Dennis landed his first Mahi again within 30 minutes of putting out the lines. 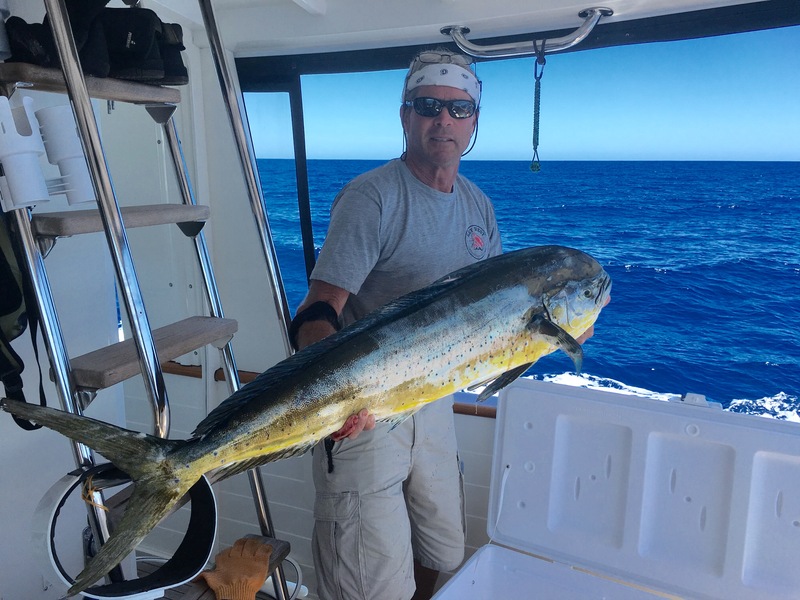 A second much bigger Mahi soon follows the first into the cooler. This one is a whopper at 54”. Another record for Idyll Time. 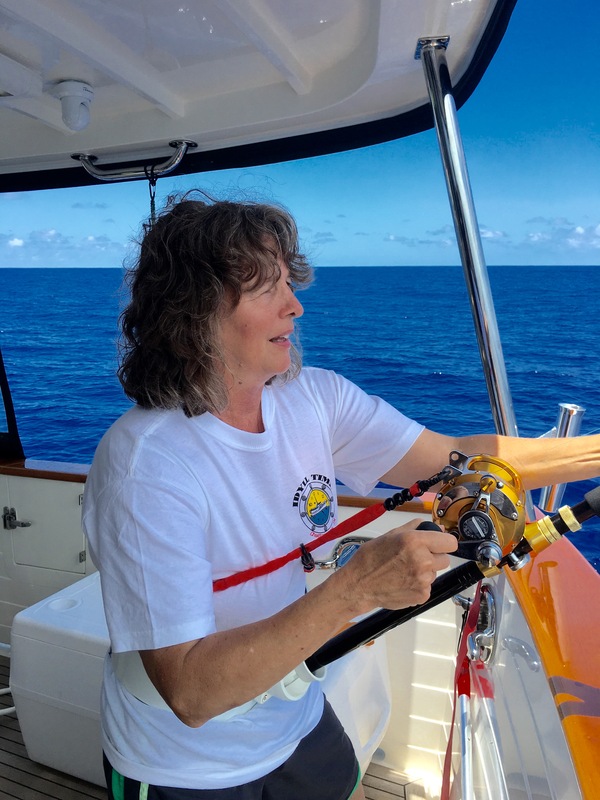 Mary follows by hooking a small black fin Tuna. 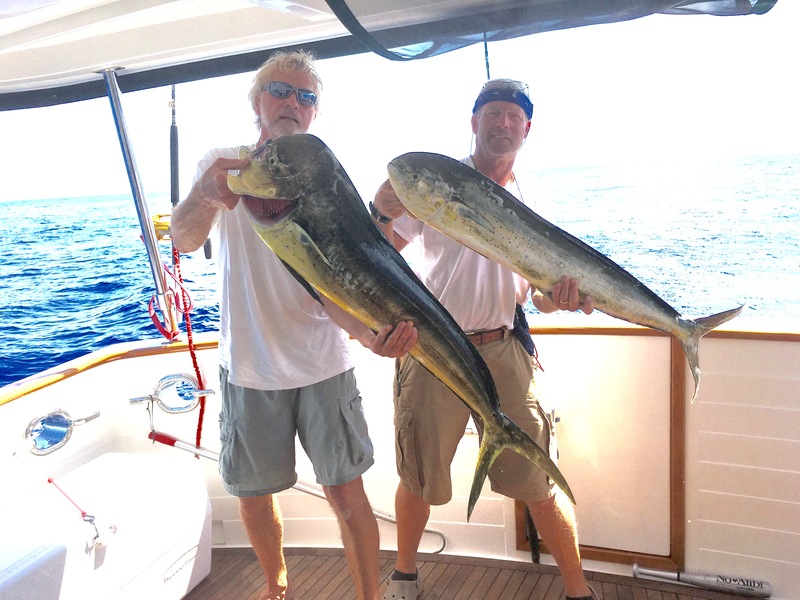 Several delicious Mahi dinners are shared with good company over the next few days. The freezer is also packed to the max with fresh fish. No more fishing says the Captain! 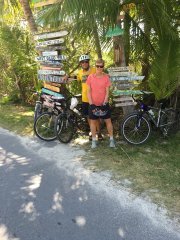 Our fun week with Dennis and Mary ends in Hope Town with more beach walking, biking, and another tour of the lighthouse. A farewell dinner of crab stuffed lobster tails aboard Idyll Time, caps this most enjoyable visit. We sadly say goodbyes as the ferry service shuttles our guests to Marsh Harbor for their connecting flights back to Chattanooga. We take advantage of the good weather and begin our northwestward trek back to the U.S. 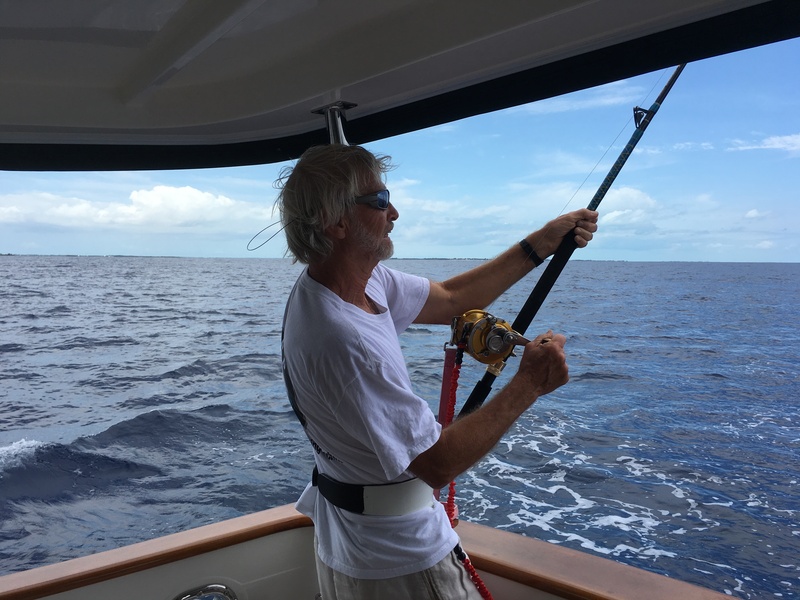 In order to reach our next stop of Green Turtle Cay, we must transit the Whale Cay passage, taking us briefly out into the Atlantic and around the 1.5 mile long Whale Cay before coming back into the Sea of Abaco. During periods of bad weather, large swells from the North Atlantic stack up in the narrow channel entrance causing what is known as “Rage”. Because of this, most cruisers dread this passage. Today we have nothing but calm seas and little wind. Nearing the pass, we hear a Mayday call from a boater who is taking on water. We monitor the situation as rescue boats converge on the stricken vessel. This makes us a little tense as just a few days ago two other boats struck an unknown object in this same location and almost sunk. They both sustained severe hull damage but reached safe harbor before sinking. 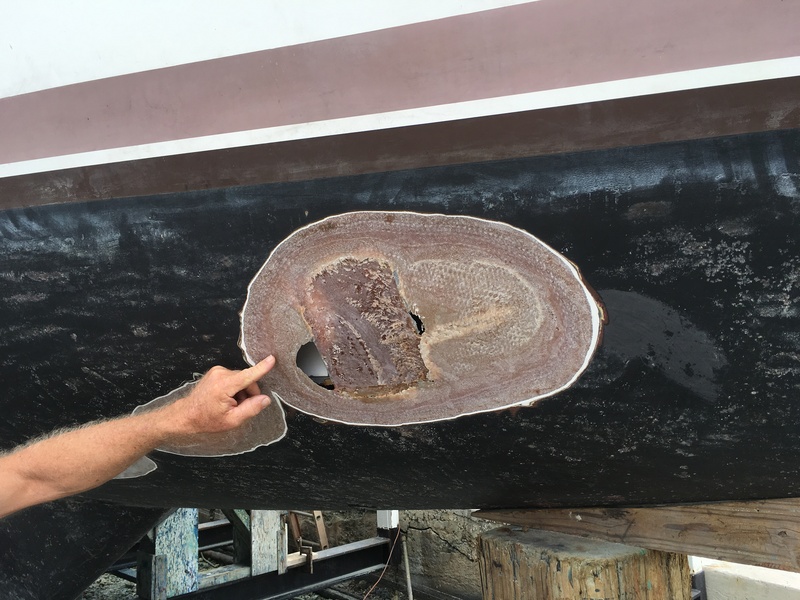 We talked with one of these boaters in Man-O-War while he was repairing his hull. 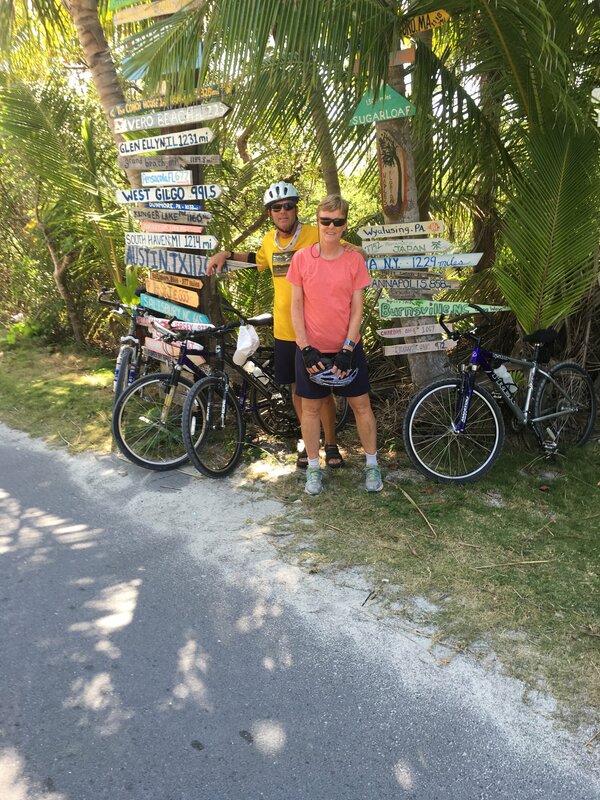 Because of this, we decided to take an alternate channel into the Atlantic and around Whale Cay. It turns out this last Mayday was caused by a hull fitting that had come loose not something underwater. Although we feel bad for the boater, we are relieved to hear there is no danger of something lurking below. Once safely back inside the Sea of Abaco, we anchor just off the New Plymouth Settlement of Green Turtle Cay. We launch Time Out and head in to the public dock for exploration. 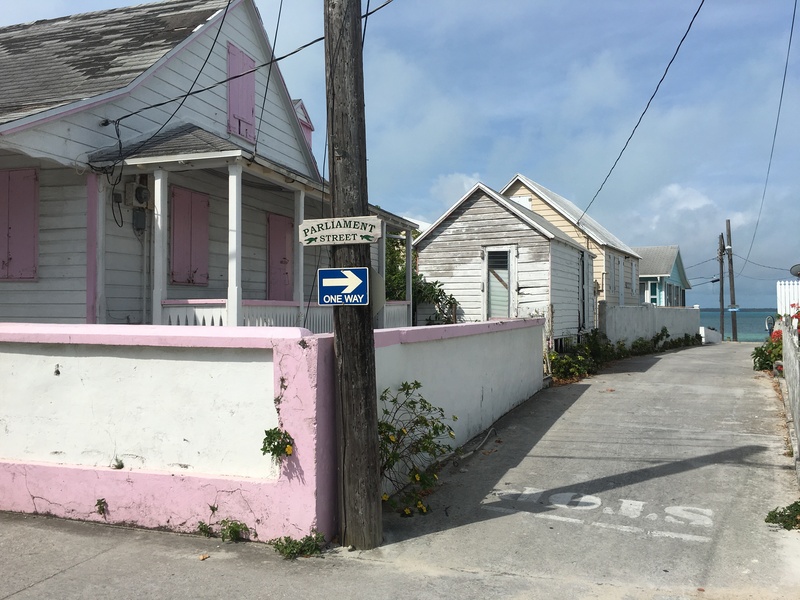 Similar to other small Bahamian Cays, the quiet town is made up of brightly colored cottages with narrow concrete paths for golf carts. This small settlement relies almost exclusively on tourism and visiting boaters. We contribute to the economy with the purchase of homemade bread and pumpkin roll from the local grocery. Talking with the store owner, we learn that unlike Hope Town, Green Turtle is struggling to attract visitors. Its remoteness and lack of transportation to Marsh Harbor seems to be the culprit. We will be sue to stop here next year and do our part to help sustain this pretty little settlement. Tomorrow starts our return trip to the US. This entry was posted on May 25, 2016 at 4:45 pm. You can follow any responses to this entry through the RSS 2.0 feed. You can leave a response, or trackback from your own site.